When the young naturalist Charles Darwin returned from his Beagle expedition, he realized he needed help identifying the birds he had collected. He turned to one of London's leading ornithologists, John Gould. Looking at Darwin's collection of finches and mockingbirds, Gould had surprising news. Where Darwin thought he had about six different forms of finch, Gould found 13, and Gould divided the mockingbirds into three species. As every biology student learns, Darwin didn't keep meticulous notes on the locations of his finches (Captain FitzRoy helped him reconstruct his travels), but he had good enough documentation on the mockingbirds to easily figure out that each species Gould identified was confined to its own island. Soon after meeting the ornithologist, Darwin attended a lecture of Gould's in which he classified a rhea Darwin had collected as a new species. Historians point to Darwin's interactions with Gould as pivotal. Gould's species classification helped Darwin connect location with speciation — the catalyst for his theory of natural selection. In short, John Gould is associated with perhaps the single most important theory of modern biology. And yet, years after Darwin's Origin was published, other naturalists noticed with some amusement how little Gould did to highlight his own contributions in the matter. Gould wanted recognition. He wanted wealth — and managed his money shrewdly and drove hard bargains to get it. But he was no revolutionary. Above all, Gould wanted respectability. Associating himself with a theory that gave admirable upper-class Brits the vapors wouldn't give him that. Gould was born in 1804 in the seaside town of Lyme (later Lyme Regis) to a humble family. For much of his life, he tried to disassociate himself from his pedestrian past, finally embracing in old age the idea that he had been "a child of nature." Around 1825, he moved to London and at the age of just 23, became curator and preserver of the Zoological Society of London. There he made connections with influential naturalists and academics. In less than four years, he had published his first book about birds. Gould's publishing career was bolstered by more than his involvement with the Zoological Society. He made a smart marital match with Elizabeth Coxen. Apparently his colleague and her relative, a taxidermist specializing in birds, introduced them. Elizabeth not only came from an ornithological family, she also possessed a talent Gould sorely lacked: artistry. Gould could draw but not very well, certainly not nearly as well as she could. In the course of his publishing career, Gould published nearly 3,000 plates, yet few if any of them were executed by him. Elizabeth was one of multiple artists to work with Gould over the years. Another was the sickly, obsessive, insecure, quirky poet and artist Edward Lear. Lear was as lousy at managing finances as he was gifted at illustration, and Gould got the better of the young man when they "collaborated" on a book about parrots. Lear wound up signing over the copyright on his monographs to Gould, so overwhelmed was the illustrator with financial troubles. Decades later, Lear described Gould with mixed emotions: offensive manners, good intentions, egotistical. Gould's wife Elizabeth also earned a reputation for long-suffering devotion to Gould, and her devotion included more than illustration. After accepting a commission to work on Darwin's Zoology of the Voyage of the Beagle, Gould departed before finishing it. Wishing to banish accusations that he was an indoor naturalist, he was off to Australia, wife and eldest son Henry, aged seven, in tow. They spent two years on the continent, leaving a four-year-old son in boarding school, and a two-year-old daughter and six-month-old infant in the care of relatives. Elizabeth missed her children terribly, and worried about her mother's health back in London. She also missed her husband who spent much of their time in Australia off in the wilds while she stayed with acquaintances. Meanwhile, she bore Gould another child, Franklin Tasman. Gould found the trip more than worthwhile. Months of collecting armed him with enough material to write one of the most comprehensive books on Australian birds ever complied. He identified many new species and even studied the bower bird, the creature whose artistically minded males woo females with elaborate shelters. Gould also compiled a work on Australian mammals, which perhaps gained even more fame than his Australian bird writings. When the Goulds finally departed Australia for England, Elizabeth was overjoyed. An assistant of Gould's, John Gilbert, was less than pleased. In Gould's employ, Gilbert had traveled different parts of Australia, planning to meet up with Gould and his wife and return to England with them. The Goulds departed weeks ahead of schedule, while Gilbert was still collecting in the wilderness. To make matters worse, Gilbert discovered that his personal belongings, which he had left in Gould's care, hadn't been cared for at all. They had been left unattended and later were stolen. After Gilbert finally did reach England, Gould quickly arranged for him to return to Australia to collect more specimens, this time on a three-year trip. Gilbert never made it back from the second trip. Part of a small company exploring the region around the Gulf of Carpentaria, he was killed by Aborigines. The captain of this small expedition, who survived the incident, painted a picture of an unprovoked Aboriginal attack, but later evidence emerged that members of the small party had assaulted a woman at a nearby village, and the attack on the explorers' camp was an act of revenge. Either way, Gilbert was dead. Gould made little effort to investigate the death of his employee, something some modern observers find callous. But he likely had his hands full as a busy publisher and, now, single parent. Elizabeth was again pregnant when the Goulds returned to England, and died soon after giving birth to their eighth child. One might suspect, given how she juggled motherhood, extended travel, and a demanding schedule as her husband's illustrator, that she died of exhaustion. In fact, her death certificate listed puerperal fever. She probably died as a result of her devoted physician not washing his hands before the delivery. Given where the Gould family lived, it's actually remarkable any of them survived. For almost 30 years, Gould lived on Broad Street — the same street that held the infamous pump identified as the source of the horrific cholera epidemic in the mid-19th century. In fact, just yards from the Gould residence was a workhouse with some 500 inmates. Gould's secretary, charged with overseeing the care of the children left behind while Gould and his wife were in Australia, wrote the ornithologist urging him to find a different home but to no avail. Gould had too many books and specimens to move. Remarkably, when the cholera epidemic arrived, only one member of the household sickened: a servant who managed to recover. Gould coped with the loss of his wife by throwing himself into his work. One type of bird proved especially useful in distracting him from his woes: the hummingbird. After receiving his first specimen of the metallic-feathered bird (a skin), Gould was hooked. 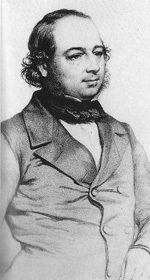 He started work on his five-volume monograph in 1849. In 1851, at the Great Exhibition, he displayed dozens of stuffed hummingbirds, to the delight of Queen Victoria, Prince Albert, their daughters, and about 80,000 other visitors. And yet Gould didn't see a live specimen in flight until he visited the United States in 1857. When he finally did see a hummingbird fly, he couldn't put a description into words, something anyone who's seen a hummingbird in person can understand. Gould tried to bring some hummingbirds home to England, but whether from their confined quarters or diet of uncooked egg yolks, his tiny passengers all died, either during or immediately after the trip. 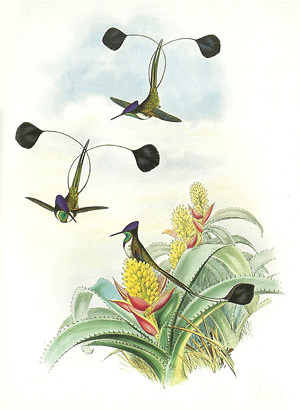 The loss was a little ironic because Gould conscientiously portrayed the tiny birds with the vegetation of their natural habitats. He had greater success describing them. To depict hummingbirds, he used a technique involving gold leaf and varnish. He credited himself with inventing the technique, but in fact there were priority disputes. He continued his monograph on the tiny, jewel-toned, aerial acrobats, finally completing it in 1861. Among the dozens of species documented were the marvelous spatuletail, shown here. Hummingbirds helped distract Gould from the untimely death of his wife, and perhaps from the death of his son Henry, who died suddenly from a fever. When his favorite child, Franklin Tasman, also succumbed to an untimely death, Gould retreated into a depression from which he never completely recovered. He died in 1881 at the age of 76.